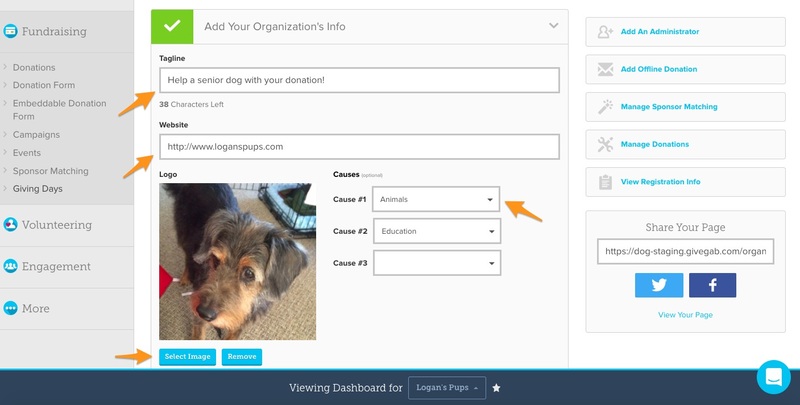 Expand the first tab on your Giving Day Dashboard to add your organization's logo, website URL, tagline, and up to three causes that best represents your organization. Once you've completed this information, click the "Save" button. 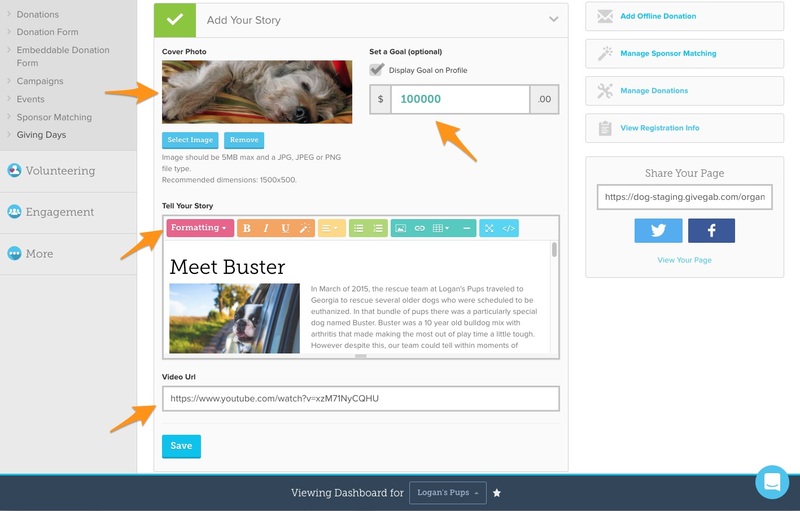 Expand the second tab on your Giving Day Dashboard to add a cover photo, YouTube or Vimeo video, set a goal, and customize your organization's story. Once you've completed this information, click the "Save" button. 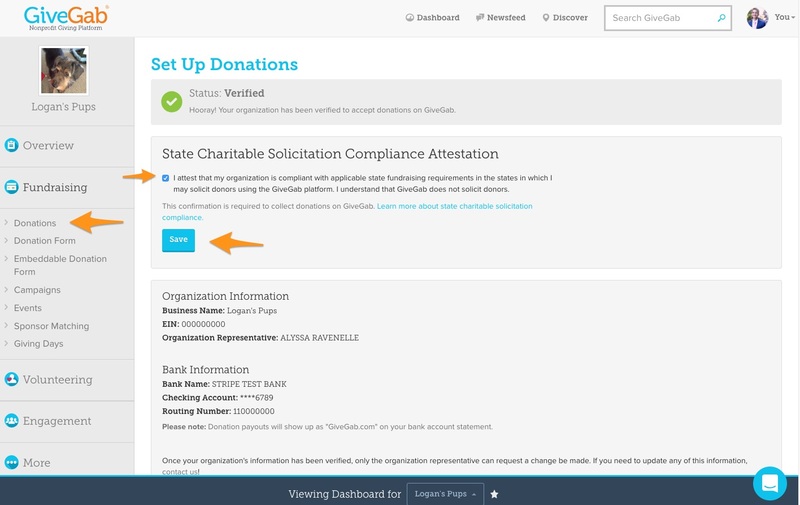 Head over to the Donations tab under "Fundraising", and at the bottom of your donations page, select "Edit Organization Info" to find your banking information, and and the box attesting to state compliance. When you check the box you are attesting (defined as "declaring that something exists or is the case") to the best of your knowledge that your organization is compliant with applicable state fundraising requirements in the states in which you may solicit donors using the GiveGab platform. Once you read the statement, click on the box to check it. Then, select the "Save" button. If you want to learn more about state fundraising compliance, click the link to learn from experts at Harbor Compliance. Scroll down from the "Edit Bank Info" page to add your organization's general information, organization representative, and bank account information to become verified to accept donations on the Giving Day platform and to receive your donations through ACH direct deposit transfer. Once this information is complete click "Save" and your organization should be verified to accept donations within 2-3 business days. 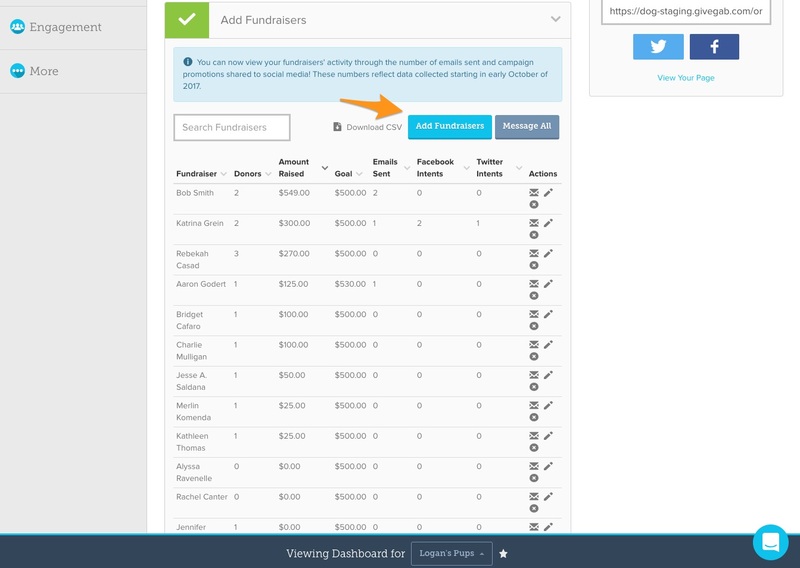 Expand the fourth tab on your Giving Day Dashboard to add donation levels to your Giving Day profile. 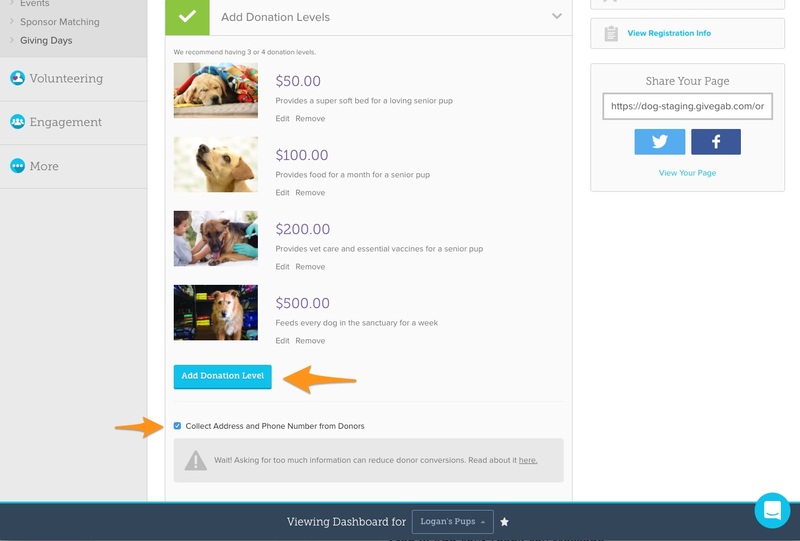 Here you can set a custom amount, description, and photo for each donation level. From this tab, you can also opt-in to collect phone numbers and mailing addresses from your donors when they give through your Giving Day profile. Expand the fifth tab on your Giving Day Dashboard to add a custom thank you message that your donors will receive immediately after making their contribution to your organization, along with a tax-deductible receipt. 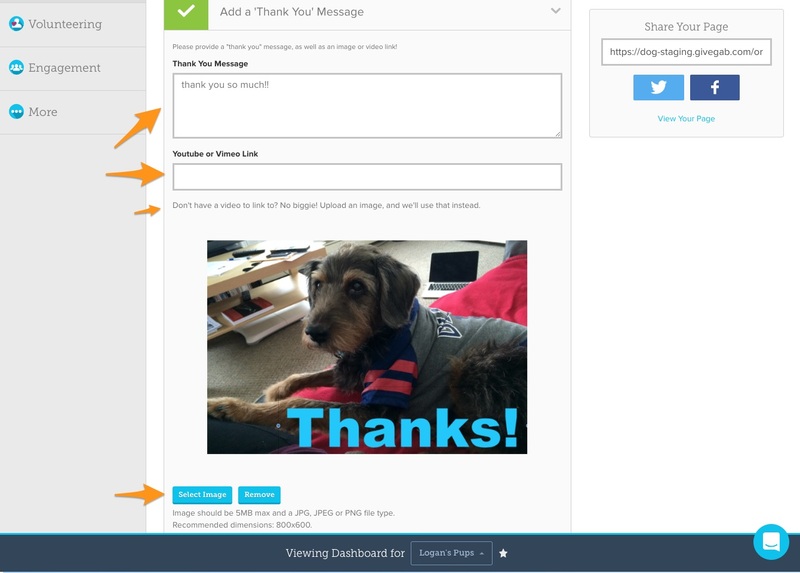 Here you can add an image or video (Adding a video will replace any image you add) and a custom message. Once you've completed your thank you message, don't forget to click the "Save" button. Expand the sixth tab on your Giving Day Dashboard to add P2P fundraisers that will support your organization on the big day. Adding P2P Fundraisers is optional, but can help expand your reach to new networks and help acquire new donors through your current supporter base. 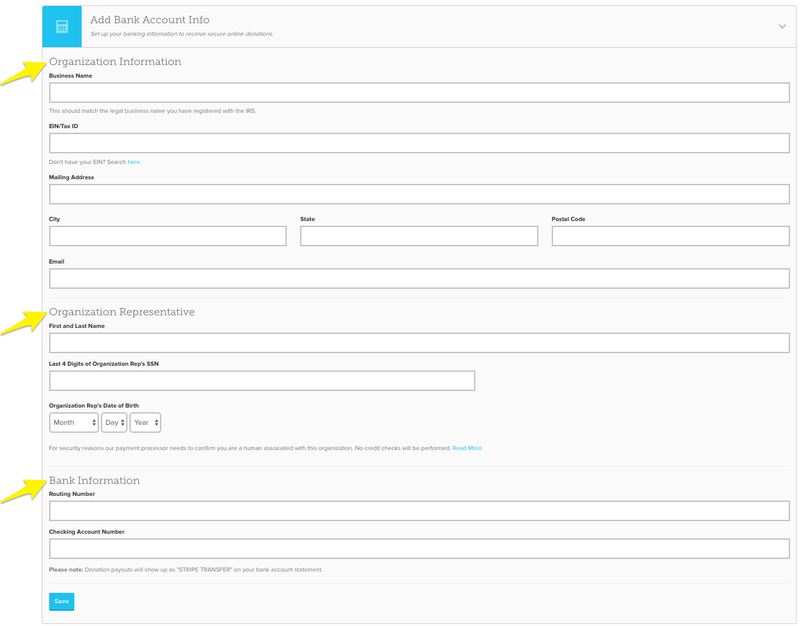 Here you can add fundraisers, message fundraisers, and remove fundraisers. You can also enable/disable the ability for fundraisers to sign up right through your Giving Day profile. Once your profile is complete each section should have a green check mark next to the heading. Once you see 6 green check marks on your Giving Day Dashboard, you'll know you're ready for the big day!